MOSH FUN KITCHEN A new concept of dining and entertainment. At MOSH you’ll be able to experience delicious food, signature cocktails and great music. Spain Weddings – Why Spain? So, why get married in Spain? There are so many reasons why Spain is the perfect place in which to get married. Firstly there is the food. Every Spain wedding features traditional mouth-watering dishes such as tapas and freshly caught fish. This is all accompanied by the local wine and plenty of dancing. Then you have the perfect backdrop for stunning wedding photographs; from beach weddings in Spain, to weddings that take place in the local village or by a stream, all will make the perfect setting for beautiful photographs. Finally when you choose Spain for your wedding you have the perfect honeymoon destination all in one place. One of the most idyllic areas to get married in Spain is Marbella at Costa del Sol. Weddings in Marbella are incredibly special and personal because of the romantic atmosphere and breathtaking scenery. The Costa del Sol also has so much diversity with regards to the wedding venue. There are so many different wedding venues in Marbella to choose from. You can choose to get married in a picturesque villa, in a church, a courtyard or on the beach. Different venues also cater for large wedding parties or for when you need something a little more private. The choice is ultimately yours. When you choose a wedding in Marbella, on the Costa Del sol, then you will enjoy a truly special and romantic day to treasure for the res of your life. When planning a wedding in the beautiful Costa del Sol, then a perfect setting has to be the beach. A Marbella beach wedding has so much to offer everyone, from the glorious sea, sunshine and the perfect romantic atmosphere. There are so many beaches located along the coast in Marbella and with so many wedding planners offering Marbella beach wedding packages, there will be a perfect beach setting just for you. There are so many fabulous beach wedding venues in Marbella that include: Finca Cortesin Beach Club, The Beach House, Villa Tiberio and Vincci Estrella del Mar Beach Club. 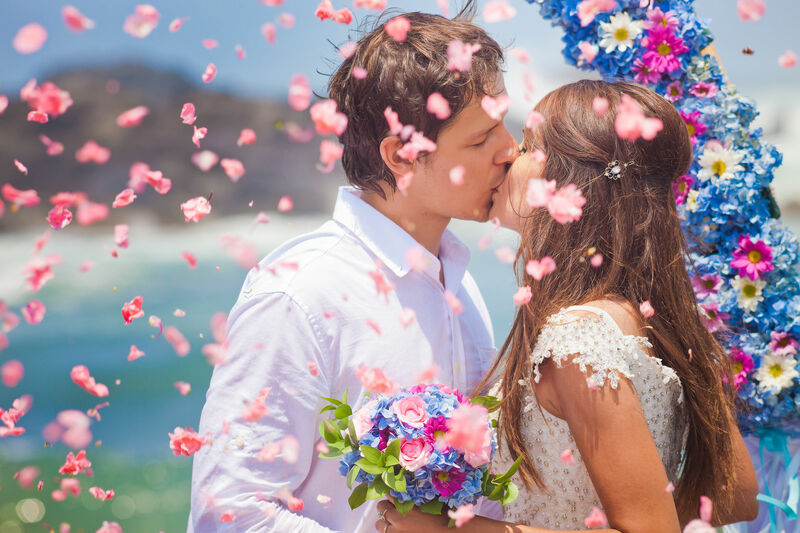 The true beauty of organising beach weddings in Spain, and in particular along the Costa del Sol, is that you can get married during any time of year. If you wish to get married in Spain, then there are certain steps that you need to take during the planning process. When organising your wedding in Marbella you will need to contact the venue where you wish to get married, so the church or registry office. It is very important that you have the relevant paperwork necessary before the big day and that it is ready for inspection. The Spanish authorities are very strict when it comes to the legality of marriage and all paperwork must be completed. One option that many couples take is to have a civil wedding in their home country and to then have a wedding celebration in Spain. This cuts out most of the paperwork leaving you to simply enjoy your wedding day with friends and family in beautiful Spain. For those couples who already reside in Spain, the only legal requisite is that of translating the marriage certificate for legal and town hall transactions. Weddings in Marbella are romantic and beautiful occasions. Have fun planning your perfect Spanish wedding.